With August now appearing on the horizon, let’s run through what ThreeWeeks has planned for Edinburgh Festival 2018, our 23rd year covering the Scottish capital’s big cultural party. The ThreeWeeks team will be previewing, reviewing and interviewing once again at this year’s Festival, along the way checking in on the Edinburgh International Festival, Edinburgh International Book Festival, Edinburgh Art Festival and – of course – the magnificent Edinburgh Festival Fringe. 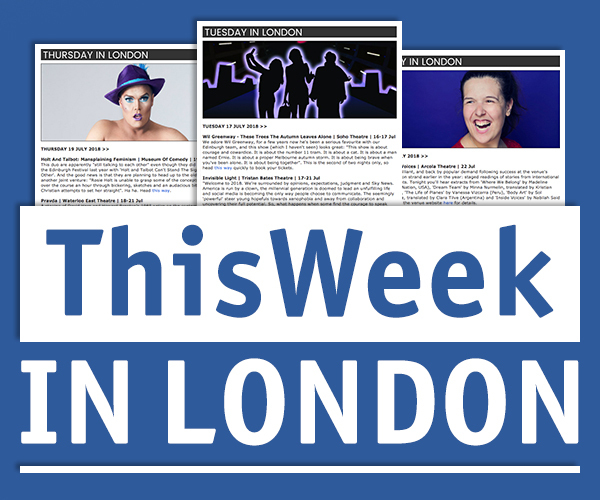 Interviews: ThreeWeeks Editors Caro Moses and Chris Cooke will be interviewing many of our favourite performers, weekly throughout May, June and July, and daily during the festival month itself. Three To See Previews: Caro will be selecting her customary Three To See show recommendations ahead of the Festival this year, all of which will appear in our Preview Edition. Plus look out for more Threes To See during the Festival itself. Reviews: And most importantly of all, the ThreeWeeks review team will be out there reviewing from the first day of Fringe previews, with a daily helping of reviews coming out from the first weekend of the Festival. There will be two editions of the popular TW Magazine again this year. The Preview Edition, published in late July, will be packed with interviews and show recommendations. It will be landing on the doorsteps of thousands of homes around Edinburgh just before the festival kicks off, and will be available to pick up at all the key venues as the Fringe gets going. The Review Edition, published in mid-August, will be packed with interviews and loads of reviews of the best shows to see at the Festival this year. You can pick up a copy from all the key venues, plus cafes and bars around central Edinburgh. 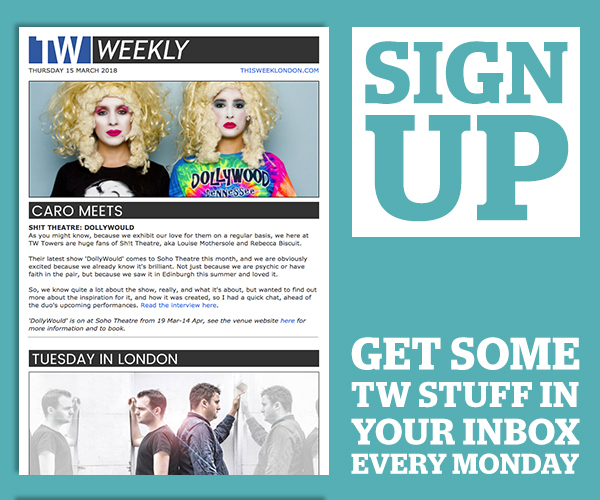 To get all the latest coverage, you need to sign up to the TW Daily bulletin, which will land in your inbox every Thursday in May, June and July, and then daily throughout the festival month. Inside you will find all the latest interviews and Three To See show recommendations. We try to feature as many shows and performers as we possibly can each year, covering all the genres, with big name acts and companies alongside the very newest talent and alternative shows and performers. For information on how to make sure you are on the radar of Editor Caro Moses, click here. Advertising with ThreeWeeks is a simple way to put your show and your name in front of thousands of ticket-buyers and all the key opinion formers and decision makers at the Edinburgh Festival. Both editions of the TW Magazine are distributed in prime locations all over the festival city, and are picked up by festival-goers just as they are making their key ticket-buying decisions. Our preview edition is also delivered direct to thousands of Edinburgh households, meaning an advert is a cost effective way to get your show in front of all the key local ticket-buyers, who are especially important at the start of the Fringe. For details of how you can advertise in the TW Magazine and TW Daily bulletin click here. Remember, we operate ThreeWeeks Edinburgh as a not-for-profit venture – all monies generated through advertising helps us extend our coverage. We are looking for reviewers to join the ThreeWeeks review team. 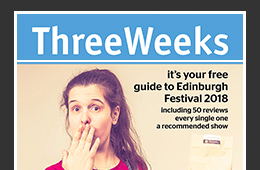 To apply to join the ThreeWeeks review team at Edinburgh Festival 2018 email examples of your published work to caro@unlimitedmedia.co.uk. You should tell us what dates you plan to be in Edinburgh during the festival this year and what genres you are able to review. The deadline for applications is 16 July 2018. Reviewer roles are voluntary, though we offer a contribution to expenses and provide press tickets to the shows you are allocated to review.